The craftsmanship and quality you need for your commercial project Commercial roofing, siding & window services in Greater Cleveland Commercial services by the experts at Roofsmith Restoration. Roofsmith Restoration has been servicing commercial properties since 2010. With vast experience under our belt, we continue to provide roofing, siding, and replacement windows for commercial properties all throughout Ohio. We combine our expert craftsmanship with exceptional customer service to deliver a finished product any property manager would be more than pleased with. Roofsmith Restoration's staff of certified roofers can handle jobs of any scale, all within a reasonable budget in a timely fashion. A commercial project is a big job - one that we know all too well. With that being said, we not only offer commercial roofing, but we also specialize in windows and siding installation. Commercial buildings function their best when their exterior components are well maintained. Here at Roofsmith Restoration we can install energy-efficient windows and high-grade siding options from leading manufacturers. New roofing, replacement windows and new siding can allow your building to function at its full potential and it will look great for as long as you own it. Our expertise in commercial projects along with our top-of-the-line materials can ensure a lasting, quality job that will never require work or maintenance over the years. Siding installation for new construction projects, as well as repairs and replacements for existing buildings. 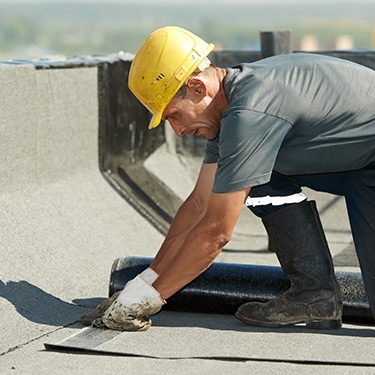 Commercial roofing installation & replacement systems. Small repairs for windows on commercial buildings, as well as affordable replacement options. Leak evaluations and storm damage related services for roofing & siding. Courteous professional service. At Roofsmith Restoration, we recognize that your commercial property is a valued asset that plays a major role in your business success. Our pledge is to always respond quickly to your commercial roofing needs and to deliver the best value and highest quality every time. All of our commercial projects start with a detailed inspection and on-site consultation. We take the time to inspect your property and offer the best solutions on the market today, at a competitive price. With the highest quality products and services, Roofsmith Restoration can ensure a well-crafted, finished job you can be proud of.